This is a list of unanswered questions or things I just haven't had time to test. I'm posting this in the hopes that other people will add their own mysteries or, better yet, that they know the answers to some of these. I have also included a list of discoveries I made while resolving items on the mystery list that I felt were mildly interesting/useful enough to warrant inclusion. I use AoMEE but I'm sure some of these will apply to other versions of AoM. - Why do some embellishments appear invisible or black when another of the same object has been placed and is visible on-screen? - Why do some objects with animated UV maps appear animated during pre-placement but static when placed? - Can large radius meshes be rendered far outside the terrain even if the DCL radius is small? Can the DCL radius ever extend outside the terrain? - How many mipmap levels does EE use and is this number adjustable? - Is it possible to make the alpha channel in icons be used for player color instead of transparency? - The file sfx g lighting scorch.dcl has a lightmap tag, what does it do? - Why are some models exported with AMP visibly darker than others? Android provides this picture. - Is there a way to tune the degree of transparency using the RenderAfterWater proto flag? - Do special attacks work against units that carry the VisibleOwnerOnly flag? - What proto tags make or allow the bored animations to play? - How do idletimeout and boredtimeout tags work? They seem to be a sort of “population average” timer so that all units don’t play at the same time, but it's not an uncertainty range, because some units do play at the same time, and it doesn’t respect the time at which the units were placed in the editor. - Which proto flag caps the carry capacity of units that autogather like herd animals? - Why do some terrain textures have black lines on them (not at seams)? - What the heck is going on when you delete the surface texture in waterbodies.xml or set the surface texture to another, correctly sized terrain texture? - Is the Servant using his ExperienceUnit tag? What do these proto tags do? They are not listed in Warrior Mario's guide. - In EE, objects without materials appear white during pre-placement and black when placed. - The terrain uses a continuous, smooth curve for normal vectors, this can be seen by bringing an object carrying the OrientWithGround flag near to a sharp terrain edge as in this picture. - Terrain names can include spaces unless you want them to have a custom blend. Custom blends defined at the end of blends.txt will only work for single words so you must use _ if you want the terrain name to look like multiple words. - HeighBonusMultiplier only takes effect when the relative difference in elevation between the units is >=3.23 meters. The multiplier does not depend on the relative elevation beyond or within this limit, the HeightBonusMultiplier uses a Boolean test with the 3.23 limit, there is no malus for units that are 3.23m below their targets, there is only a bonus for units 3.23m above their target. Asking for how to activate the bored-anims: Does the boared-anim not work if such is specified in the anim? Maybe that has something to do with the "NoIdleActions" Tag. Some interesting questions there. Also some I don't understand, mainly graphics related ones. But I'll ask in the Meta-Plays forum about that again. I think Hagrit knows what the values actually stand for. I was at one point trying to get the wandering animals in AoM to play their bored animations. 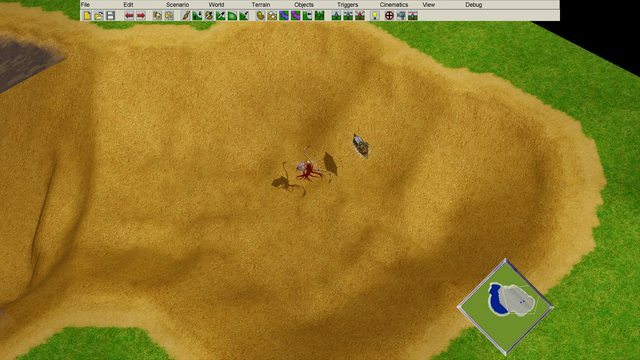 Almost all of the animals in AoM and aoe3 have bored animations but we never see them (they are even defined in the anims). My first thought was that the units were wandering before bored could play. So I removed wander but they still won't play their bored animations. I replaced deer's proto data with hoplite and it played its bored animation. Conclusion: somewhere between the data for hoplite and deer are some tags that allow bored animations to play. I have tried capping carry capacity with a carry capacity line. Unfortunately, it's not that simple. I have some whale units that wander around the map and can be fished for gold. The idea was to start them off with some small amount then have them autogather to some capacity. They can be fished by multiple boats at once so the idea was to strategically not overfish them. Unfortunately, the whales keep autogathering gold forever and ever even with a carry capacity line. So somewhere between pig and whale there are proto flags that allow carry capacity to work. I have read that post by the great DeathShrimp himself. Unfortunately, he doesn't give numbers and that's really where the mystery is. His post does reveal that there aren't a finite number of "misses" at the start of each attack cycle, it actually depends on the accuracy param. He tells us what TrackRating does but not how it works. It will require some testing, but I feel like there are threads on this topic somewhere on AoMH. Check the pharoah for the ForceBuildingData(or something similar) flag. It allows things other than buildings to train units. NotPlayerPlaceable is the tag that doesn't allow a unit to be in the editor units list. Nope, that's NotPlayerPlaceable. NotSearchable does not have that effect. Awesome, thanks for the suggestion. It does do this and without the negative consequences of having your unit targeted as a building. Long time no see people. I love that this old gem of a game is still being explored, and old mysteries unraveled! Iirc, when you have a scenario with a certain water type, then edit that waterbody in waterbodies.xml, if done "correctly", the water becomes invisible, effectively allowing naval and amphibious units to "float" in the air where there would have been a body of water. Is this old news maybe? Or is it of interest to anyone? Just thought it would be fun to add, though I still haven't successfully repeated the effect yet. Oh yeah and as you can see this is EE, not sure if the effect will be the same on TT. @Xzaander - That's a very interesting result but I can't seem to reproduce it. Could you post your code from waterbodies2.0.xml before and after? And is that the only file you edited? Yup, waterbodies is the only file edited. I discovered that the only thing you actually need to remove is the "surface" definition. I think the order in which things are done is of importance here. 2.) Make a new waterbody, I suggest copying an existing one and making it the last waterbody. 3.) Rename it to whatever you like. Save waterbodies2.0.xml. 4.) Open the game, go into the editor and find your new waterbody. Use the "Paint Water" tool to paint some. 5.) Save the scenario, name it whatever you want. Exit the game. 6.) Open the edited waterbodies2.0.xml again, and remove "water" from the "surface="water" definition. Save. 7.) Open the game again, go into the editor, load your scenario. The water should now be invisible. If it still doesn't work, I don't have any clue as to why. I found out that the Condition "Player Unit Count" is not working on some of the units. Lampades Blood, Scarab Blood and the Hero Death are not triggering it, no matter the player number. I believe "NotSearchable" to be the culprit. Izalith is correct, units with the NotSearchable tag cannot be picked up by trigger commands (such as units in area, distance to unit, player unit count, etc.). I can't remember it for shure but I think units with 0 obstruction radius can also walk through cliffs even if they are only defined as land units. Objects appear invisible inside the mapeditor if one places them after a rescale into new added areas. But after a playtest they show up correctly. Why are fly animations not controlled by anim files? They take over most of the stuff that is defined but e.g. switch back to different textures every time when they get send flying. Btw: Will it possibly be possible to edit prototags like UseAlternativLightning in future? 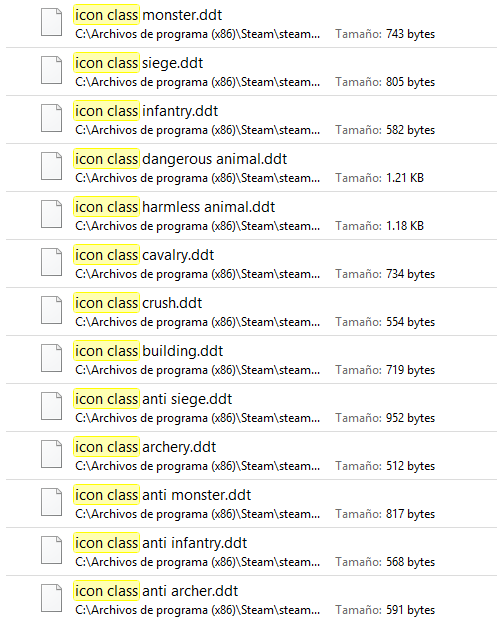 What do icons "icon class ..." in the game? During the development of Age of Mythology, Ensemble Studios went through several UI (User Interfaces) aswell as many features within them. @XLightningStormL. It would be great to add that feature again. - Rocks align to the surface, but Cinematic Rocks do not. By normal placement there is no variation allowed to place those units as an excavated sword / fully build horse. However using Copy&Paste on the units allows you to place the fully constructed variant ignoring that flag (more or less, I think they still start at 1 HP). According to the orientation data of units it looks like they're usually placed rotated 180 degrees on the y axis. I can remember someone (I think Lewonas?) stating something about this a long time ago but not sure if I remember it correctly. He does! You can simply try this by letting him kill a couple of fishing ships and then fight against another servant. Funny thing is, I assume there is likely some sort of greater flexibility in the Unit Experience, especially considering that originally the Norse (at least around the Late Alpha/May-August 2001 period) originally had a feature where they're infantry units would automatically be upgraded into heroes upon gaining a certain amount of "experience".